Posted May 23, 2018 by Howell Laboratories, Inc. 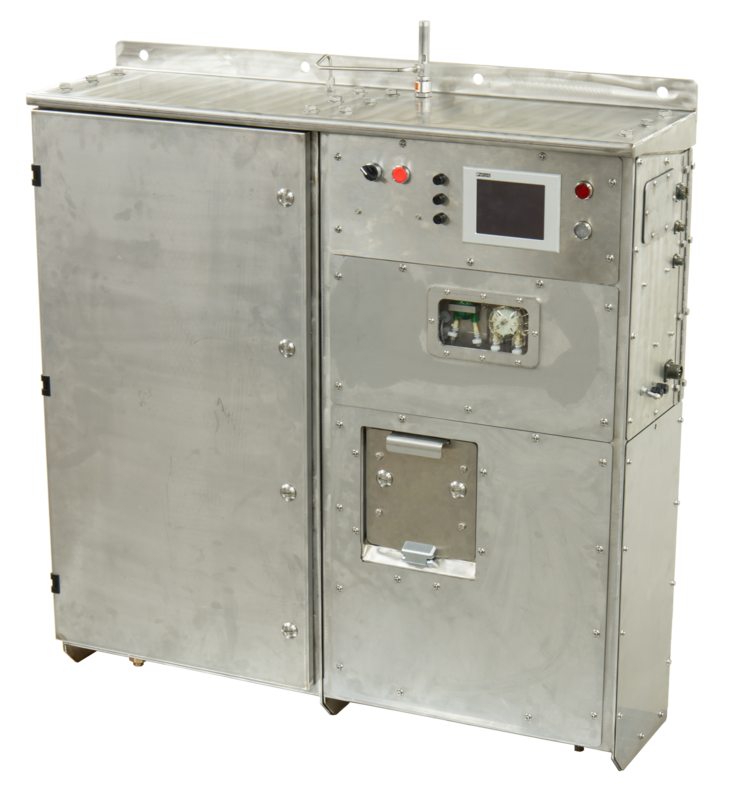 The Model 9130 Mixed-Oxidant Electrolytic Disinfectant Generator (MEDG) is an on-demand on-site mixed-oxidant generator, design to be capable of disinfecting two sources of water simultaneously using an injection process, with minimal operator attention. The MEDG is an electrically operated, package-type (bulkhead-mounted) unit ready for operation (turn-key system). The MEDG uses granular or pellet salt (sodium chloride) and potable water as inputs to produce a concentrated disinfectant solution using electrolytic cell technology. The disinfectant solution is metered into the discharge from the ship’s desalination plants as an initial disinfectant and/or metered into the recirculated water from the ship’s potable water tanks to maintain the proper level of disinfectant. The US Navy shifted to MEDG technology for purifying potable water on its amphibious ships and aircraft carriers in the early 2000’s. MEDGs generate an improved version of sodium hypochlorite called Mixed Oxidant Solution (MOS) on demand, using common salt and electricity. Salt is inexpensive, readily available, requires no special handling, and is easy to store; most importantly, there is no HAZMAT by-product generated from MEDG operation. When first introduced, MEDGs were not yet appropriately scaled to smaller ship classes and were most attractive for ships with very high potable water demands. 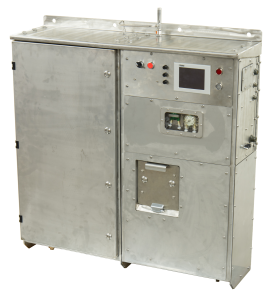 Today, the HLI 9130 has the ability to be configured to accommodate potable water demands for small, medium, and large ship classes for the US Navy, USCG, and MSC marine platforms. The HLI 9130 is small enough for back-fit and forward-fit installations. For more information see the Product Page.